CBD (Cannabidiol) products are used in the treatment of inflammation, pain, anxiety, insomnia, seizures, muscle spasms and more. We all know how CBD works! But have you experienced the powerful therapeutic properties of CBD in its fullness? Our CBD Healing Salve has a concentration of 40% — the highest concentration that can be found in any CBD-infused cosmetic. The Healing Salve also contains other organic oil extracts from coconut, sweet almond, and beeswax. 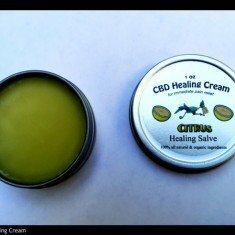 This CBD Healing Salve unleashes its full potency immediately after being applied to the skin, to give relief to any kind of pain or muscular tension you may be feeling. Our amazing CBD Healing Salve can be applied on any area of the affected skin, and even injured areas such as cuts and bruises, and infected skin. It also works as a treatment for eczema, dermatitis, and psoriasis.